What gorgeous silk! Those colors are just so yummy! I love the idea of photographing the wool. Nice job. Wow, what a different thing to photograph (at least from my world). 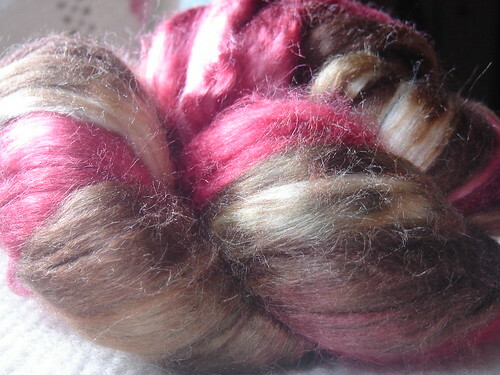 That silk fiber is so pretty, you can see the shininess of the strands in your photos. Very lovely. Beautiful, I share your fibre love! I love how you chose fiber to photograph. My fave is the unfocused one. Happy Spring! I like the first one and the birds eye view. What pretty fiber. 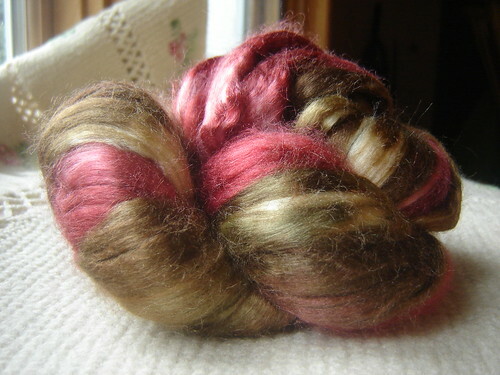 What a beautiful silk roving!! The window light is wonderful on it! You did a great job! i think this beautiful fiber could be the toast of NY fashion week if worn as an accessory! the third photo with the light in the window is particularly lovely. That is truly lovely…beautiful fiber and color. Very nice how you have used the light.#2 is my fave. Lovely – no 3 is my favourite. Beautiful silk fiber and light!!! oh, i agree with jared flood. his work is beautiful! i think yours turned out lovely. you captured the light so beautifully in the third photo and i love the fourth photo! Lovely colour, and the texture of the background, the little flowers in the fabric… I love the sunlight streaming over your silk! 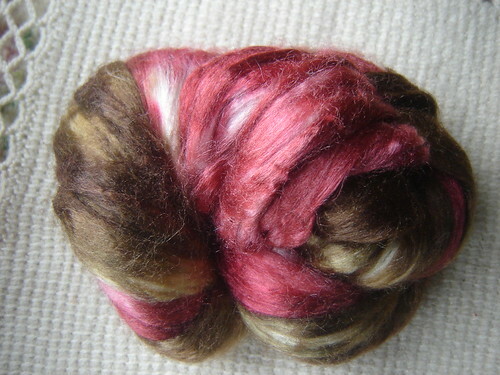 I agree that photographing fibre and yarn can be very difficult – especially if you’re after “true” colour. 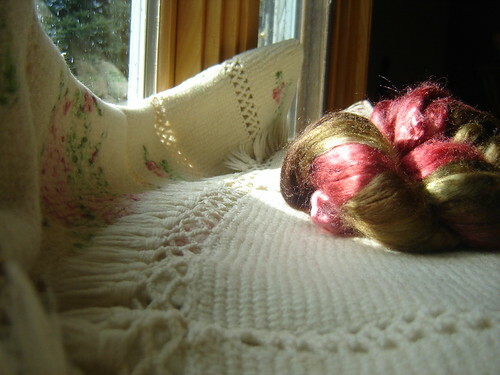 I love the third photo with the light coming in from the window capturing the shine of the silk. I think you’re on the right track – white background and good lighting plus lots and lots of practise! Lovely colors and shine on the silk. I like the second photo best. 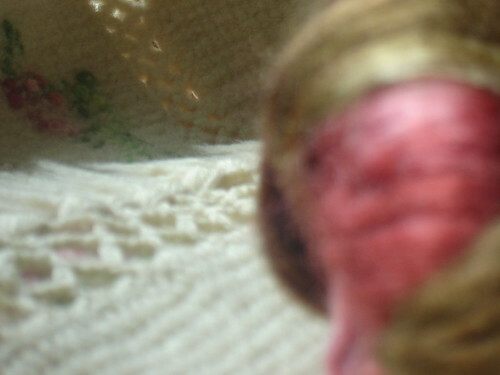 I don’t have any helpful suggestions because I don’t have a clue, but maybe it will help to look at photos on the internet with yarn and fiber and see how the light and texture are captured on them. I’m reading the book Understanding Exposure and I hope that this will help me. Wow! I can’t wait to see what it turns into. Really nice light.